Split large PDF files by pages into small. A-pdf split is a very simple, lightning-quick desktop utility program that lets you split any acrobat pdf file into smaller pdf files. It provides complete flexibility and user control in terms of how files are split and how the split output files are uniquely named. A-pdf split provides numerous alternatives for how your large files are split By pages, by bookmarks and by odd/even page. Even you can extract or remove part of a pdf file. A-pdf split also offers advanced defined splits that can be saved and later imported for use with repetitive file-splitting tasks. A-pdf split represents the ultimate in file splitting flexibility to suit every need. 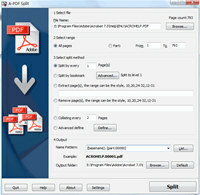 A-PDF Split is an utility that works under windows xp, . Estimated download time for A-PDF Split on a common adsl connection is less than a minute. Version 4.8.3 was released one thousand eight hundred forty three days ago by A-PDF.com. Click the green download button to download it now.